Friday night started with a quick trip down to the restored mine tipple at Blue Heron for a night photo session conducted by Steve Barry of Railfan magazine. The rain stopped long enough to let us photo outside the tunnel before we re-boarded. The K&T climbs a steep grade to get into Stearns. A highway overpass provided the perfect photo line, especially with the convenience store next door with hot coffee. The cold and rain made the K&T shops a great place to spend some time. On the way back down the hill, we stopped for photos in some of the most rugged country along the line. The train headed on to Blue Heron with a stop for the train to pose on the bridge near Camargo. The day ended back at Barthell with a number of photos in the town. Here the train is beside the old school house. We retired for the evening to our cabins, such as the one in the background of this final runby. 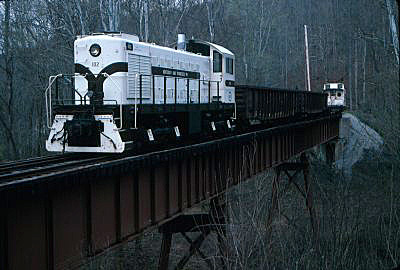 March 28-30, 2003, the Southern Appalachia Railway Museum sponsored a weekend for photographers from around the country to ride, photograph, and explore the Kentucky & Tennessee Railway in the mountains and valleys of the Big South Fork National River and Recreation Area. This area was once the home of the Stearns Coal & Lumber Company and its many coal and logging activities. Our special photo freight operated on all of the useable track between the mill town of Stearns and the coal mine encampment at Blue Heron. Passengers rode in the K&T caboose or on one of the freight cars. All events were based at Barthell, Kentucky. This former Stearns Coal & Lumber Company mining town has been restored by the Koger family. This includes 12 miners cabins, company store #2, a school house, motor house, coal mine, bath house, doctor's office, and a number of support buildings. Our photo weekend started in 70 degree sunshine on Friday and ended in a light snow on Sunday.